It may seem obvious to locals, but tourists need to know where to go to soak up the sun and find the best places to swim, even in the winter time the Sunshine Coasts beaches are a fantastic attraction. While there are other options, especially if you're looking for a quieter more secluded experience, and everyone will have their opinion on the best beach, these three main beaches have plenty to offer and you simply can't visit the Sunshine Coast without going to at least one of them. Pictured in the leading image, King's Beach in Caloundra is a great family orientated location. It features great BBQ locations, a wealth of great fish and chip shops nearby and you can even see dolphins from the boardwalk if you're lucky. There's lots of grassy areas and super fun places for the kids to hang out and play. Throw in a line not far from the beach or just relax and enjoy the waves. Swimming is fantastic at King's Beach where the waves never get too rough. Noosa Main Beach, picutred above, is usually bustling on a weekend and for good reason too, yes, even in winter! It's known as one of Australia's great beaches. Even with so many people enjoying the sunshine, the place never seems crowded because the beach is quite wide. The firm sand left by the tide in the afternoon is perfect for ball games like beach volleyball or beach soccer. There's a bunch of great café's and shops near the beach and the sand is golden. The waves are a little bigger on Noosa's Main Beach so you can do some great surfing. There's also great spots to snorkel and see what lies beneath the waves. 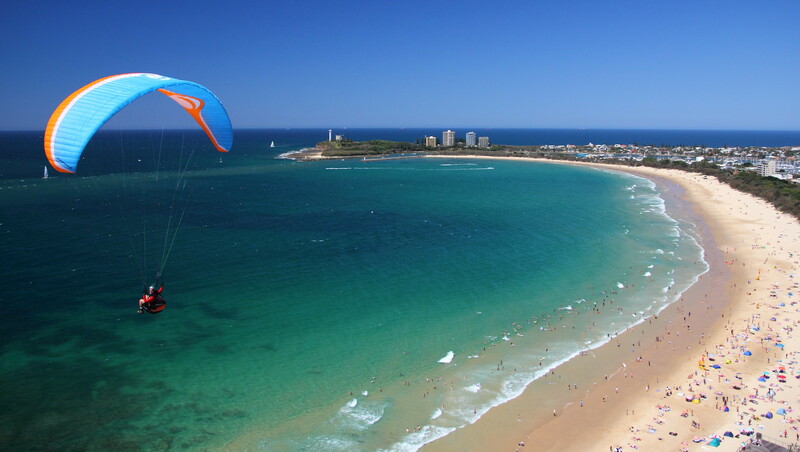 Mooloolaba Beach, stretching away, is a well protected location that's fantastic for relaxing and soaking up some rays. There are some great rocky areas and kids will love exploring to see what the tide left behind in the rock pools. There's a boardwalk for an easy stroll and like the other two, there are some great restaurants, fish and chip shops and café's to take advantage of while visiting the beach. The calmest of the three beaches, Mooloolaba is great for little ones but those looking for pumping waves should head further north or south along the coast to find some spectacular surfing locations. This beach also isn't usually as crowded as the others which might factor in to some people's plans. All of these beaches are patrolled by Surf Life Savers and are protected. Remember, don't swim outside the yellow and red flags. Also, don't underestimate the power of the Australian sun. Even in the cooler winter months, a few hours in the water even with a good application of sunscreen WILL leave you with sunburn. Make sure to bring a hat, beach umbrella, sunnies and lots of sunscreen to keep topping up every few hours. Image 1, By Mynameisben123 at en.wikipedia, CC BY 3.0, https://commons.wikimedia.org/w/index.php?curid=6736959. Image 2, By user thinboyfatter, uploaded to Flickr, Sunshine Coast Walk_20110807_0269 Kings Beach Caloundra - Mid Winter. https://flic.kr/p/aaHckF, licensed under CC BY 2.0.